Hanoi's summer temperature, which has been the hottest in the last 50 years, has just become hotter as newspapers report that: More than 1,300 trees lying along Pham Van Dong street, Hanoi will have to be moved or cut down before September 30 to implement the investment project to expand the belt road 3 Mai Dich - Thang Long Bridge. This is a project by the Investment Management Board to build traffic works in Hanoi (Department of Transport and Traffic of Hanoi) - hereinafter referred to as Project Management Board. According to the plan, the road expansion will cut more than 1,000 trees, move 158 trees, and prune 142 trees. 1. The Project Management Unit has not yet published the Environmental Impact Assessment Report. 2. There has been no survey, consultation, or survey of people in the affected area (especially in places where trees will be cut). Fortunately, and we also note, the press has been well aware about the situation and had timely reported the plan to cut more than 1000 trees. 3. No civil society organization is consulted during project implementation, let alone participate in independent review. 4. The PMU affirmed that the removal and cutting of trees is compulsory. The construction and expansion of Ring Road 3 is subject to the preparation of an Environmental Impact Assessment Report, in which detailed plans for removal and relocation of trees are required. In addition, the number of trees that the project management wants to cut and relocate amounts to more than 1,300. This makes it more imperative to make and publish the Environmental Impact Assessment Report. Cutting down more than 1,000 trees is unacceptable in all urban construction and development projects around the world. We would like to emphasize: Sustainable development is the development to meet the needs of the present generation WITHOUT JEOPARDIZING posterity. In other words, sustainable development must ensure that economic development is equitable, that society is fair and that the environment is protected. To achieve this, all socio-economic sectors, authorities, social organizations, etc., must work together to reconcile the three main areas: society -economy - environment. For sustainable development, the environment must be protected from harm. There can not be any reason to justify cutting down hundreds or thousands of trees. In the context of Vietnam in general and Hanoi in particular: The people of Vietnam and Hanoi are all affected by climate change. In addition, the people of the capital are suffering from poor urbanization, air pollution caused by smoke and dust from construction sites. The cities are severely lacking trees. We don't need to hypothesize this effects to the future generations, even this current generation is suffering from environmental pollution and environmental degradation in the name of "development." Green Trees is convinced that if all urban planning and development projects are consulted with a broad spectrum of people and civil society, transparency and democratization, then every problem is resolved. - Situation at this time: Pham Van Dong Street for vehicles moving together. The two sides of the road is the tree line that the project management is demanding to cut down. - The extension line of the current road extends to both sides, and two rows of trees will then become the middle of the extension. (Therefore, the project management will tighten). - Suggestion: Keep the current road intact only for motorized vehicles. The road section could be extended to both sides for rudimentary vehicles. (See picture). 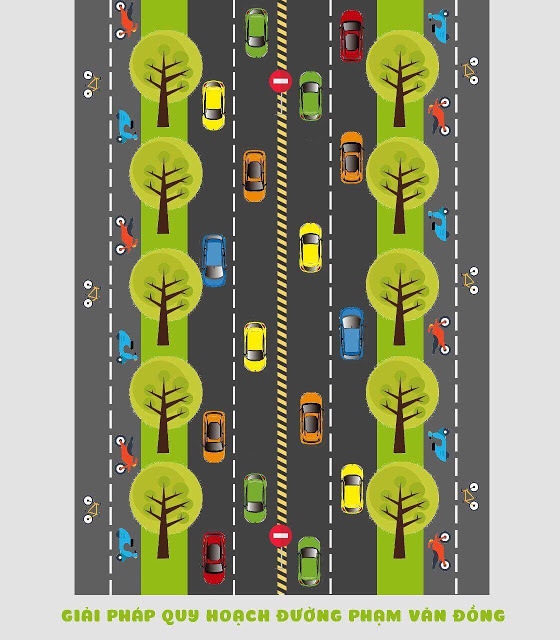 This option has the advantages of lane segmentation, ensuring the safety of commuters; while retaining both rows of trees. This is only a proposal from Green Trees, and again, we reiterate: We are convinced that if all urban planning and development projects involve extensive consultations with civil society organizations, while being transparent and democratic, there is always a solution to every problem. There will be many more reasonable and better proposals to both develop and protect the environment for all of us. - Provide a full detailed, concrete, and viable plan of action to preserve the trees. If cutting down trees is the final option, there should be proof beyond reasonable doubt. - Provide consultation with people and civil society organizations during project implementation. - Immediately abolish the plan to cut and remove trees on Pham Van Dong Street in the proposal.